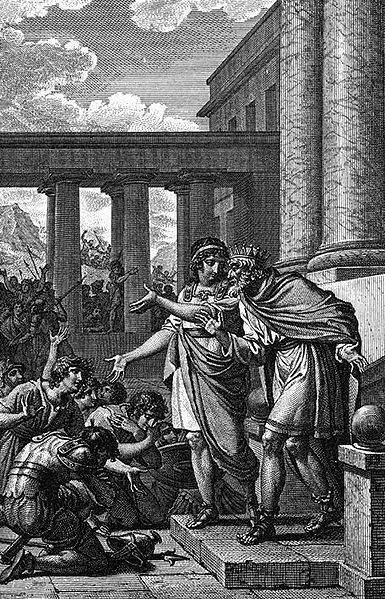 Aeacus might not be a well-known name today, but the name relates to one of the plethora of kings from Greek mythology, and indeed, Aeacus was a prominent king and a relatively important one. For Aeacus was a son of Zeus, a king of Aegina during his life, and one of the Judges of the Dead in the afterlife. The story of Aeacus begins with the abduction of Aegina by Zeus. Aegina was a Naiad, a water nymph daughter of the river god Asopus and Metope. Asopus was blessed, or cursed, with 20 very beautiful daughters, all of whom were desired by the male gods, and so Asopus became very protective of his daughters. Nothing though could stop Zeus, other than perhaps Hera, when the supreme god decided to have his way with a beautiful maiden. To separate Aegina from her father, Zeus transformed himself into an eagle, swooped down upon Aegina, and whisked her away to the island of Oenone in the Saronic Gulf. Now, initially Asopus was unaware of the abduction of Aegina, but was told of the actions of Zeus by Sisyphus (this being one of Sisyphus’ many misdemeanours). But even with the news of Aegina’s abduction, Asposu could do little, for even as the Potamoi approached the island of Oenone, so Zeus threw down thunderbolts to dissuade the river god. Zeus would have plenty of time to consummate a relationship with Aegina, and so of course a son was born to the Naiad, this son being Aeacus. Zeus would decree that the island of Oenone would be known as Aegina in honour of the water nymph. Aegina would subsequently be married off to a prince of Phocis called Actor, and her amongst her other offspring was Menoetius, a named Greek hero, and one who sailed on-board the Argo. Aeacus himself would grow up on the island of Aegina, and would become king of it. One version of the Aeacus myth tells of whilst Aeacus might be king of an island, he had no subjects for the island of Aegina was uninhabited. To rectify this Zeus was said to have a kingdom with subjects to rule over. To populate the island Zeus was said to have transformed a colony of ants into people, giving rise to the Myrmidon people. In a second version of the tale, Aegina was once populated, but Hera sent forth a plague which killed off the island’s entire population, save for Aeacus; Hera seeking revenge for her husband’s affair. To repopulate the island, Zeus would thereafter transform the ants into a new generation of people. Aeacus would subsequently appear in a number of different mythological tales. Famously, Aeacus would be one of the companions of the Olympian gods Poseidon and Apollo during their exile amongst men. Zeus had exiled his brother and son for plotting against him, and so the two gods were forced to undertake menial work for others. At one point the company of god and men would find themselves in the city of Troy, where King Laomedon would employ them. Apollo would tend the livestock of the gods, whilst Poseidon would build Troy some new city walls, and Aeacus would assist in the building of the walls of Troy. When the party sought their wages for their work, Laomedon decided not to pay for the work, and in retribution a plague was sent down upon the city, and a sea monster, the Trojan Cetus, would ravage the beach side. Troy would only be freed of the plague and monster when Heracles arrived in the region; but once again Laomedon refused to pay for the effort of Heracles. So Heracles besieged the city of Troy, and when the walls were breached it was said that Telamon was the man to breach the wall at a point that his father had constructed. At home, Aeacus was loved by his subjects, and respected across Greece. Aecacus would make Aegina a defendable island by constructing cliffs as walls, having learned from Poseidon at Troy, and subsequently Aegina was far more secure against invasion or pirates. Aeacus would also gain a reputation across Ancient Greece for the justice system that he created for the island of Aegina, and for the fairness in which the laws were enacted. 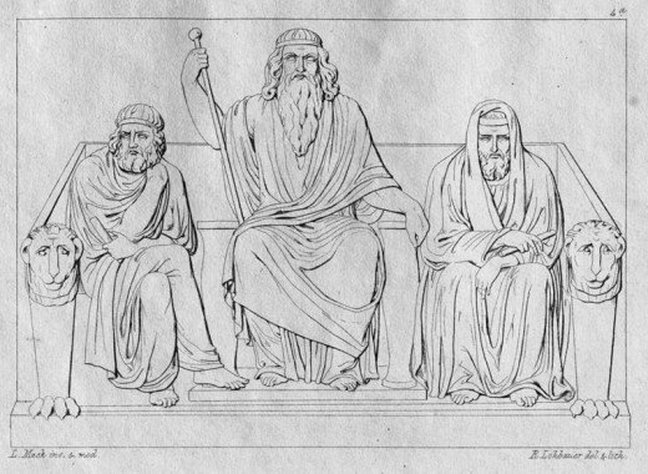 Kings and gods would subsequently approach Aeacus to settle disputes. All was not well upon Aegina though, for jealousy abounded in the royal palace. Aeacus’ wife Endeis was angry at the favouritism seemingly given to Phocus, the son of the king’s mistress, whilst Telamon and Peleus were jealous of the sporting prowess exhibited by Phocus. A plan was hatched, possibly at the instigation of Endeis, and Phocus was subsequently “accidentally” hit upon the head by a discus thrown by Telamon. Aeacus would banish Telamon and Peleus from Aegina for their actions. Aeacus would become grandfather of Achilles, whilst the King of Aegina was also grandfather to Teucer and Ajax the Great via Telamon. The story of Aeacus continued though for in recognition of his fairness as king, Aeacus would be made immortal, and would forever sit in judgement upon the dead. Aeacus would therefore sit with King Minos and King Rhadamanthys in the Underworld, to decide upon the eternal fate of all the deceased, with perhaps Aeacus judging the dead of Europe.